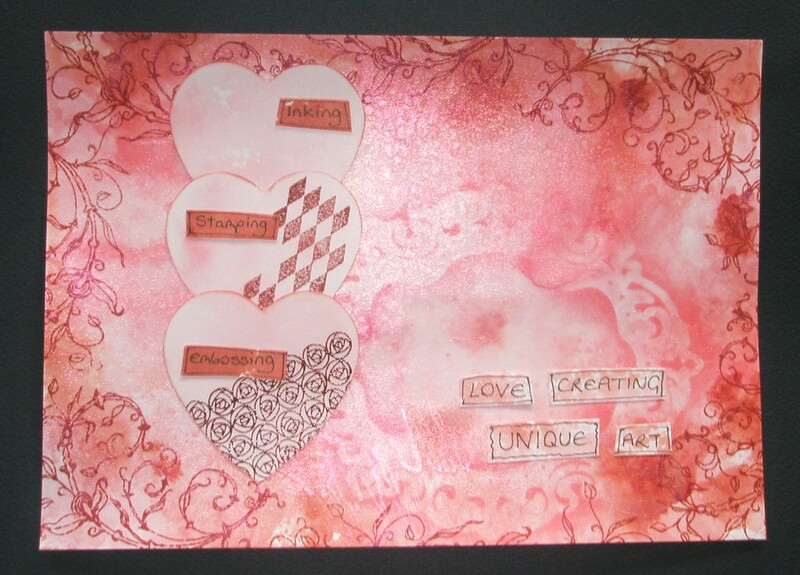 I came across The Craft Barn's Art Journal Challenge and thought I'd have a go. The theme is Filled with Love, so hearts filled with what you love. Have to say I've never done this before but I do love making Distress Ink backgrounds - they always turn out differently hence the UNIQUE ART. I also love stamping and heat embossing. I don't have a journal so just used an A4 sheet of card which I can bind into a book later...as I enjoyed creating this page I'm now thinking of doing the House challenge from last month. Anyway I've used Worn Lipstick, Fired Brick and Aged Mahogany Distress Inks spritzed with a Craftynotions Pink Lustre. There's a Glimmer Mist Screen in the background too. The stamps are from Oak House Studio - Harlequin, Mack Rose and Walesby Flourish - and the writing is my own and definitely the hardest part of the page. Thanks for looking - I'm off to see if I have any house stamps!! WEll done on your first page, it's really beautiful. Looking great! Adorable redish colours and embossing. Beautiful! Gorgeous page, very unique and inspiring! Thanks for joining us at CraftBarn! I cannot believe this is your first page ... beautiful work!